EON Founder Caroline de Mori noticed the many disadvantaged rural communities of the Pilbara and Kimberley regions while working for the mining and resources sector, and the issues before her really struck a chord. “As the mother of four children, she saw the children in remote communities who were really suffering, and she wanted to do something about it,” explains Marie-Louise Carroll, EON’s executive manager. De Mori and Co-Founder Katrina Burton launched EON in 2005, after further inspiration from the Telethon Institute for Child Health Research longitudinal study on the poor health of Aboriginal children living in rural areas. According to a 2016 study by the Australian Institute of Health and Welfare on the health of Aboriginal and Torres Strait Islander peoples, five of the seven health risk factors – low fruit and vegetable consumption, obesity, high blood pressure, alcohol and high blood cholesterol – come from poor diet. EON’s goal is to help these communities build lasting healthy lifestyles that will prevent diseases and chronic problems that come from malnutrition or unhealthy eating. De Mori’s main concern was creating a sustainable source for healthy food, so she spoke with a community in the Kimberley region about starting an edible garden at their school. When word got out about the garden’s success, EON was invited to other communities to help them start gardens. Thus the EON Thriving Communities Program began, providing training and education for children and adults in sustainable gardening practices, cooking, nutrition and hygiene, so they can maintain the skills EON has taught them. The program consists of four parts. Starting the fruit, vegetable and bush tucker garden in the school helps children learn how to grow and access fresh produce by employing a project manager who visits every two weeks to provide classes in maintaining the garden, cooking and nutrition. On off weeks, a community assistant employed by EON helps maintain the garden. 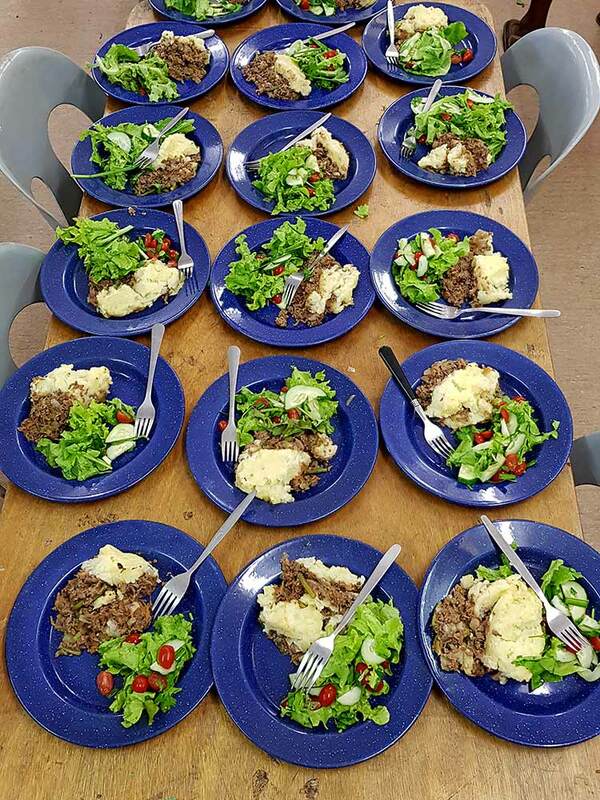 EON Healthy Eating uses food from the garden to teach children about cooking and nutrition during the school day. The Healthy Homes initiative then teaches skills for keeping a healthy home and reducing the spread of disease. The program also provides informal horticultural education on a local level so children and adults can continue to run the garden after the program is over. “If [the children] understand the link between nutrition and disease, they’re getting this education at an early age, and hopefully we can create generational change,” Carroll says. Children in communities that EON has visited are healthier and more engaged in school because of the program. A principal in Yakanarra described how “for these kids and their learning, the benefit is that it’s not just from a book, but it’s a walk out into the garden, a chance to talk about it, and it sinks in so much more”. The EON Foundation’s hard work has been paying off. Their 2017 Monitoring and Evaluation report reveals that 87 per cent of students surveyed that participated in the program for two years or more understood how physical health and eating nutritious food are connected. 72 per cent were also able to identify differences between healthy and unhealthy food and 67 per cent cooked healthy meals at home. For some community members, the EON Foundation has inspired them to develop their skills, seeking more education and jobs in horticulture. “As a result of working with EON they’ve had the confidence to go on to do a TAFE qualification,” Carroll says. The EON Foundation mostly helps communities in Western Australia, but they have started operating in the Northern Territory and are currently expanding into nine more Northern Territory communities. They are growing with every invitation, helping as many communities as they can to ensure a healthier future for the children and community as a whole.